Even with a whole bulb, break it into cloves. Put clove(s) on a cutting board. I usually cut off the root end of each clove. Lay a large chef's knife flat on the clove, then smack the knife to crush the clove. This breaks the skin of the clove and makes it much easier to peel. The trick is that you're bruising the clove of garlic a little bit so the paper will release easier -- if you're using a bulb or less, it's not too bad to do the side of the knife press method. pull out the cloves, and the paper should come off easily. if there's any cloves that are still difficult, shake longer, or more vigorously. repeat for the remaining bulbs. You can do this with two metal bowls of the same size, pressing together the lip on the rims while shaking. I don't recommend plastic containers, as you might impart a garlic flavor to them that will be difficult to remove. I take a hint from TV (and my fiancee): smash each clove with the flat part of the knife until the skin breaks, then you can easily take it off. If you are peeling the whole clove, then you can just smash the whole thing with the flat part of a bigger knife (safety first) and take all the goodies out. Great video on peeling garlic. It's basically the same method as that described in Joe's answer: Smash the head, put it all (if you need a whole head of garlic) in a large metal bowl, put another metal bowl on top, but upside down, so that the rims overlap, and shake hard for several seconds. Two methods that work great. 1: Put the garlic cloves into lukewarm water and wait 20-30 minutes. 2: Put the garlic cloves into a tupperware and shake. I'd use method one for peeling large batches of garlic that you can store in the fridge for a couple of weeks, and method two for immediate use. I call these Garlic Cannoli. Actually, they're simply called "garlic peelers." For Christmas, I gave my wife one of these as a stocking-stuffer. I had seen them in kitchen gadget stores for years, but was always reluctant to get one, believing it was another useless, cheap gadget. I used to peel garlic using a knife, but now, with this, I can peel a clove every 5 seconds. 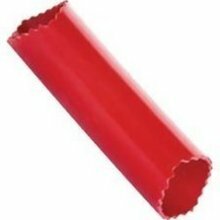 It's essentially a silicone or rubber tube. You place the clove inside and lightly press it and roll it on the counter (like you're forming a baguette). Penny for penny, I've never had such a useful gadget (except maybe a silicone spatula). If you need to keep the cloves whole, there's a nifty little tool that looks like a piece of rubber manicotti, which is specially designed for this purpose. You put a clove of garlic inside, then roll it back and forth on the counter. The clove will pop out the end completely stripped of its skin. If you don't feel like going out and buying a one-use gadget, a silicone baking mat will probably do the same thing. If you're going to be chopping the garlic, I find that slicing the garlic in half from base to tip makes it very easy to peel the skin off. I don't like smashing garlic with my knife for fear of losing a finger. Safety first. Rather than the "smash" method, I cut a little off each end of the clove and then slice the clove in half, lengthwise. Once it is sliced, the skin peels off easily. Plus, the cut allows for the (2) slices to lay flat for mincing. The side of the garlic clove closest to the core will usually have a flatish edge where the skin is thicker - if you slice at the base of the clove with the flat side down, and then rotate the knife 90 degrees, you will pull off this thick edge off easier, and frequently this will also take the rest of the skin with it. The technique I use is just a little different from the "crush" method - I like to think of it as the "smack" method. It goes a little faster because you don't need to shift your hands on the knife very much. After separating a clove, you place it flat on the cutting board and slice off the stem with a chef knife. Having sliced off the stem, you don't really need to "crush" the garlic to get the skin to separate - holding the knife normally by the handle, you can simply give the garlic one good smack with the flat of the tip, pick up the clove by the tail end, and poke it a bit with the knife and the garlic will fall out. Optionally, something that I personally find easier is not to slice all the way when you are cutting off the stem. If you slice gently and lift up on the clove at the same time, when the knife reaches the skin on the opposite side, it doesn't penetrate the hard skin. The knife keeps the skin pinned down, and as you pull up on the clove, the skin will start to separate. This gives it a good start and makes the garlic part with its skin even more readily. Try microwaving a clove for between 5-10 seconds and the skin practically falls off. Be careful not to leave them in too long, they'll explode and you'll have a garlicy mess in your microwave. This is so far the fastest method I've seen. Just put the garlic in a jar and then shake it. lay down a knife horizontaly on the cloves and hit it. This will break the clove a bit. Now cut the top, and then the bottom and the shell will be gone. The way I peel garlic is really easy - and somehow not covered in previous answers. it's easy to tug off the fine, papery skin from the garlic cloves - and it's usually necessary to separate the cloves in the first place. As for the harder inner skin - at the base of the clove, where it attached into the roots, there's a dry, hard flat place, usually triangle shaped. Usually there are ridges around the edges of this base, pointing downwards. What I do is dig in my nail to the bottom of the clove (just enough to break the skin) and peel upward. The ridge makes a good hold, and the peel breaks and peels a strip off the inner skin. Three tugs (one on each face of the garlic) has peeled most of the inner skin right off, in less than five seconds - and sometimes it takes less, if the inner skin can be tugged loose in a larger piece, or the garlic slipped out of the skin. I find this works perfectly with roasted garlic, just dig in my thumbnail and pry upward two or three times and the whole skin is off. Fresh garlic might take a little more rubbing and scraping at left behind strands, but it works basically the same way. Break the bulb into cloves, breaking off the bottom and the dry stick that goes up the middle. For each clove, press the ridge that would have been at the centre of the bulb down hard on the chopping board, crushing it. This causes the skin to almost entirely separate from the clove; using a knife at the base it then comes off very easily, you can peel the whole bulb this way in a few tens of seconds. After you have broken it down into cloves, I usually smash it slightly with my thumb or the side of a knife, and the tough peel (the shell) cracks, making it quite easy to simply peel it by hand. I do it two different ways: First, if I've been working outdoors a lot and have good calluses on my hands, I'll take a scant palm full of cloves and rub my hands together with the garlic between them over the sink or bin, this takes off most of the skin and loosens what stays behind. Second, if the garlic has large cloves, will hold the bottom and the top of the clove, top by one hand bottom by the other and twist the clove, this loosens the skin. Cut the end at both sides and down the middle to peel them. I generally microwave garlic cloves (as suggested by nachito above). 3-5 cloves 12 seconds works for me. Alternatively you can heat a pan and put cloves in it for a few minutes just to heat them up. That will separate the skin easily. In case you're only going to press (rather than chop) the garlic, you don't even have to skin it. You can just put the whole clove in the press and you'll press the garlic right through its skin. It depends. If you are going to chop, mince, dice or use them pretty much intact, I'd go with Choppy's method of crunching them with the flat of a knife. If you want to crush them in a garlic press, don't remove the skins, at all. Cut the very ends off, if you wish, and put the whole thing in to the garlic press. The smashed garlic will get pushed through the press, as usual, and the skin, intact in pretty much one piece, will be left behind and will come out of the press very easily. Not the answer you're looking for? Browse other questions tagged garlic shortcuts or ask your own question. How do I peel garlic in bulk? Is garlic peel safe to eat? Garlic brown spots, safe to eat the rest of the bulb?